I came at Caherbarnagh from Knocknagowan, no access issues from the Clydagh valley (see my comments there), from this direction once you get to the flattish top you can choose to follow the fence north and then east, or climb the fence and head straight for the trig point. Either way it's fairly sapping boggy going. Once you make it to the trig point, someone has thoughtfully provided two flat stones to sit on and have a cuppa. Views are decent in all directions, the Paps are particularly nice as you can see both summits from this angle. 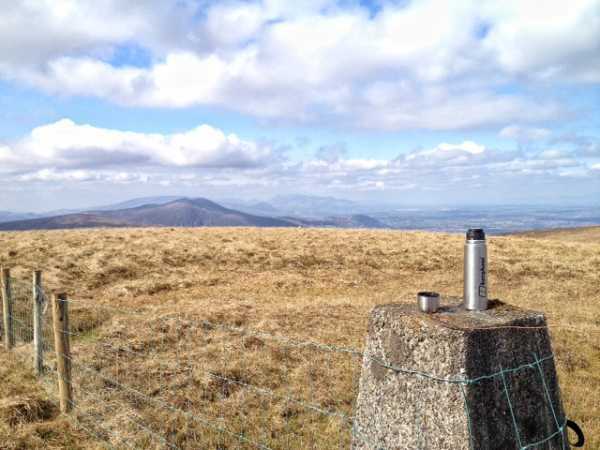 While taking my ease with a cuppa, I met a local man who arrived at the summit from the Stoukeen direction, he says it's a much easier ascent and that there aren't any access issues from Gortavehy East: however, he did tell me there is a lot of hassle at the moment as the organisers of the Millstreet walking festival failed to ask the local landowners was it ok to bring the walking festival to Caherbarnagh via their land. So it might be best to give it a few months before attempting that route. To be honest it was a bit depressing to have someone tell you that Caherbarnagh was part of their usual loop walk for during the week.